We used to vend at the Festival of Quilts shows in Birmingham, England. My friend, Yvonne, who is a quilt shop owner there, suggested that I make a hedgehog pattern. I had no idea how many people all over the world love hedgehogs. Hedgehogs are found throughout Europe to the middle east and in Africa. Here in the States, there are lots of people who keep hedgehogs as pets. They are beyond cute. My quilt pictured here measures 31" wide and 25" high. The inspiration for the plants came from my yard. The mushrooms were suggested by Yvonne. She said they were a very traditional combination. Actually, the mushrooms with the red caps repeated the red color of the nasturtiams so they were perfect for the design. If you've never made a quilt before, there are six free videos here. They show you how to make a machine appliqued quilt. The hedgehogs are thread painted. That is drawing the quills in thread by using a darning foot and pushing and pulling the fabric while stitching. The eyes on most of my critters in my patterns have glass bead eyes in a color called "iris", iridescent black. The hedgehogs have 3-D ears. I used UltraSuede. If you don't have that you could fuse two cotton fabric together to get the same effect. The leaves on the ferns and violets are two fabrics fused together and then cut out and attached to the background by drawing the veins in stitching. The advantage here is being able to audition fabric colors or prints without having to cut them twice. The violets are for my grandmother who collected them and wore purple a lot. They are satin stitched in place. When you purchase this PDF pattern, a link will be emailed to you within 24 hours to direct you to the download location. There are 14 pages to this pattern with many in color, with close up photos of my quilt. When you order a PDF pattern, the download location will be sent within 24 hours of placing your order. We have How to Applique videos if you learn visually. Watch our designer, Debora Konchinsky take you through all the steps to make a Critter Pattern Works quilt. The video on raw edge stitching could be helpful here. 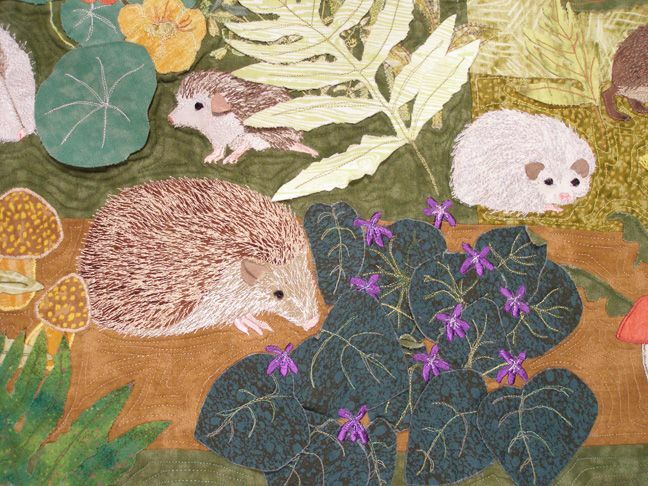 Thread painting makes the details on the hedgehogs. Just use the darning foot, with the feed dogs working, and drag the fabric back and forth to draw the texture of the quills. EASY! The noses and feet are satin stitched. The ears are 3-D beige UltraSuede. The violets are satin stitched in rayon thread. The violet leaves have little pleats in the tops of double thickness (2 green fabrics fused together) to give them dimension. They are stitched down where the veins would be, not on the edges. The same technique was used on the fern leaves. 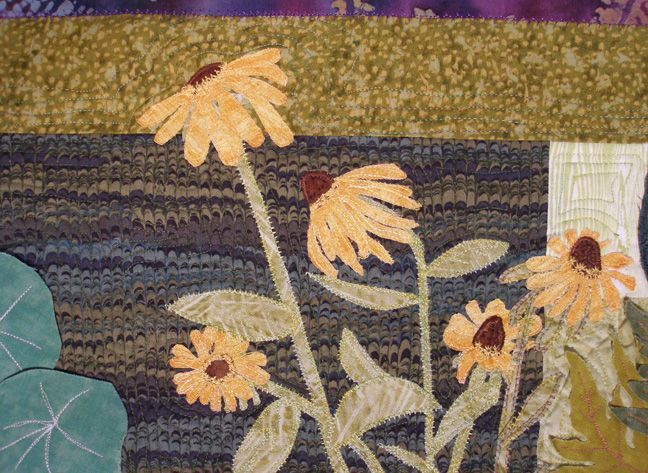 Blanket stitch was used to replicate the fuzziness of the stems on the black eyed susans. Little yellow thread stars stitches (on my sewing machine) add the details around the eyes.